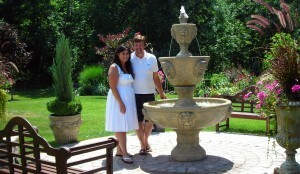 Suzanne and Bob Wiepert built their “backyard oasis” by doing a little bit each year, starting in 2006. 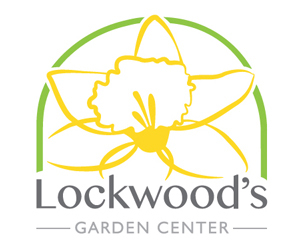 This year their gardens at 9525 Melinda won first place in Clarence Hollow in Bloom, a garden walk held Saturday, July 17 by the Clarence Garden Club. The Wieperts bought the house for its large backyard, just under an acre, which had big trees and boulders. From there, they built separate gardens and gave them names. At right is a portion of the Butterfly Island, which was the first garden they developed. 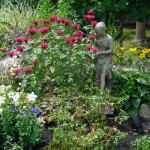 Bee balm (monarda), butterfly bush, magnolia and phlox attract butterflies. 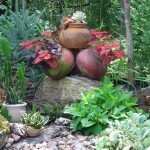 They noted that they buy all their plants in local nurseries. 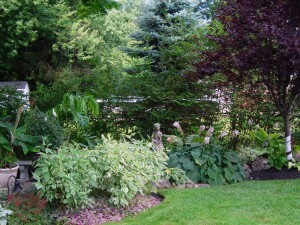 The second garden they put in was a shade garden sheltered by a 30-foot cherry tree. A few years ago in July, during a graduation party for daughter Ashley, now 21, a thunderstorm whipped through. The sudden storm uprooted the cherry tree, which just missed the house and party tent when it fell. The cherry tree was replaced by a purple plum, seen at right in the photo at right. 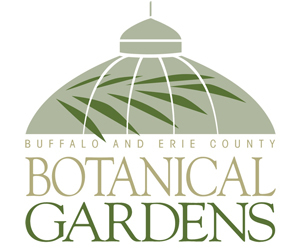 Suzanne also brings houseplants outside and sets them in the shade garden during the summer. Another storm that changed the Wieperts landscape was the October Storm in 2006. A beautiful gazebo covering the furniture on their porch collapsed in the storm. 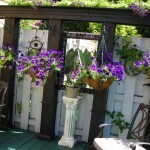 They were able to salvage a section, and now use it to create a divider and hang baskets of annuals. The patio and Leonesco fountain, seen in the first photo, were put in last year. That installation was inspired by a trip to Italy the couple took the previous year. The Southwestern Island, shown in the photo at right, features paddle cactus and hens and chicks. Other gardens include the Roman Island, which features a trellis supported by Roman style columns and flanked with grasses, and Five Sisters Island, named for the five trees in that garden. In addition to the mature trees already on the property, the Wieperts planted 30 additional trees, including a “Dillon” willow tree at the edge of the property. GORGEOUS, Wish we could have made it over we definatly need to pop in I am sure these pictures do no justice. BEAUTIFUL CONGRADULATIONS!!! Bob & Suzanne, the writeup and pics are amazing you both should be so proud of all your hard work. BEAUTIFUL! looks beautiful. how do you keep the deer out ?